You are here: Home › All, from most recent › Press releases › Retailers & Retailing › How to Bring ‘Main Street’ Back from the Brink! Stevens, PA, April 5, 2016 – Main Street USA is much more than the entrance to Disney theme parks. Main Street U.S.A. is where over 3 million small specialty retailers nationwide call home. Much of their individual success – or failure – depends upon Main Streets and the businesses that line their streets to attract customers and invite them to the unique, special experiences that their Main Street has to offer. So businesses band together to form local Main Street associations, attend Chamber of Commerce events, join national groups like Main Street America™ and participate in American Express Small Business Saturday to give a bump to after Thanksgiving sales. But ultimately the revival of the local Main Street rests on the local shop-keepers and businesses working 365-days per year to attract shoppers. 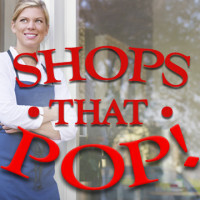 A new book from Paramount Market Publishing, Shops that POP! 7 Steps to Extraordinary Retail Success shows shop owners and small businesses the way to make their business a shop that POPs! to magnetically draw customers and bring them back for more. Success in retail is less about what you sell, and more about how you sell! The time is ripe for Main Streets and their retailers across the country to learn how to make their shops POP! “Customers today, especially the highest-potential ones with discretion to spend, are bored with the malls, ‘big box’ stores, national chains and department stores that offer more or less the same merchandise and have little excitement to share with their customers. Small is the next BIG story at retail – small as in small independently owned businesses,” Danziger says. Shops That POP! provides concrete steps that independent retailers can take to make sure they are successful in the next decade. The secret: “Success in retail is less about what you sell, and more about how you sell!” concludes Danziger. To order a copy, go to www.paramountbooks.com. To receive a review copy, email jim@paramountbooks.com. Speaker, author, and market researcher Pamela N. Danziger is internationally recognized for her expertise on the world’s most influential consumers: the American Affluent. Her latest book, Shops that POP! 7 Steps to Extraordinary Retail Success, reveals the secrets to crafting a retail shopping experience that’s irresistible to high-value shoppers. She is the author of five books including her recent mini-book, What Do HENRYs Want?, which explores the changing face of America’s consumer marketplace. Pam is frequently called on to share new insights with audiences and business leaders all over the world. Jennifer Patterson Lorenzetti is an independent writer specializing in writing for market research and analysis, industry reports, business and technology coverage, and corporate communications. Her writing has appeared in Chain Store Age, The College Store, HR Magazine, Human Resource Executive, and Private Clubs magazines. Lorenzetti teaches several advertising disciplines (including marketing, copywriting, professional communications, and history of advertising) at the School of Advertising Art in Ohio. Lorenzetti founded Hilltop Communications in 1997, and it has quickly grown to serve clients in many different industries. Prior to founding Hilltop Communications, she earned a Master’s degree in higher education administration from Miami University. She is also the author of Fast, Cheap, and Good: Sustainability, One Choice at a Time and Lecture is Not Dead: Ten Tips for Delivering Dynamic Lectures in the College Classroom. Founded in 1999, Paramount Market Publishing, Inc. is dedicated to publishing books by and for smart professionals. PMP books have consistently picked up on trends related to American consumers and the U.S. economy before these stories make media headlines. Pam’s first book, Why People Buy Things They Don’t Need, was added to the PMP line-up in 2002. More recently in Putting the Luxe Back in Luxury (2010), Danziger forecasts with amazing accuracy the progression of the Great Recession and helps business leaders understand consumers who will play the biggest role in the post-recession economy. Comments Off on How to Bring ‘Main Street’ Back from the Brink!